Hera Syndulla and the crew of the Ghost are continuing a long tradition of hauling freight across the Star Wars universe. We were first introduced to this concept back in 1977 when old Ben Kenobi hired out the Millennium Falcon to transport them to Alderaan. This connection came to mind when I saw a logo on the back of Hera’s ship that was similar to a logo on the Millennium Falcon. You can review the image above as I explain the history behind this obscure self-referencing design. To create the special effects in the movie Star Wars there were three different sized models of the Millennium Falcon made. The largest was used for close-up shots and was about five feet long. All of the extra details on the hull of the ship was created using a technique called “Kitbashing”. For those of you who may not know, Kitbashing involves taking parts from various commercially available model kits and adding the bits and pieces of them to a new model. It would appear that one of the source kits that the model makers had on hand when creating the Millennium Falcon was an Allied Van Lines truck. Just above the Falcon’s cockpit you can see the Allied Van Lines logo upside down with an red ejection seat logo on top of it. 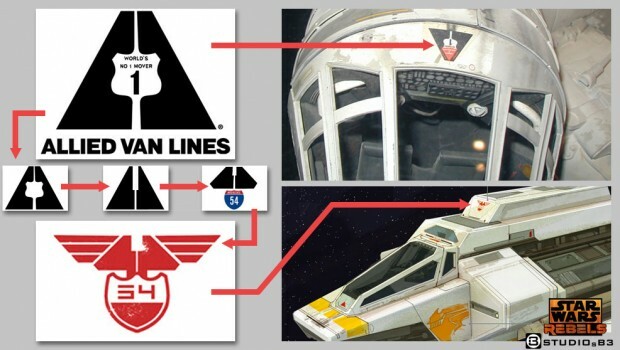 I imagine that the model makers thought it would be funny to add the Allied Van Lines logo to the Falcon since it was going to be used as a cargo transport. In the TV show Star wars Rebels, Hera’s ship the Ghost has a similar logo on it’s shuttle. Lucasfilm Animation Senior Concept Designer Amy Beth Christenson created the logo. It would appear that she modified the Allied Van Lines logo and pulled the shield from the Interstate symbol out of the center and placed it below the road shaped triangle. It was mentioned on StarWars.com the number 54 is a reference to the interstate that winds through Amy’s hometown of Kansas. By combining all the old elements with the new ones it would appear that Amy has Kitbashed a new design! Thanks go out to Studio Scale for the Falcon reference images. Previous story Meet the Inquisi-Mater!